(Climate Change) Science Is Not Up for Vote!! There are so many things wrong with this, but when I put on my science outreach hat, the biggest issue here is that it gives the impression that science is up for vote. Is 2+2=5? It might be if the Senate votes it is! That sort of thing seems ridiculous to most people, but this is the exact same thing that this headline implies: If the Senate votes climate change is happening, it is! If they don’t, it isn’t! Yes, I fully realize that this is an opportunity for everyone to score perceived points for their base, for conservatives to show that they don’t believe it and liberals to show they do. 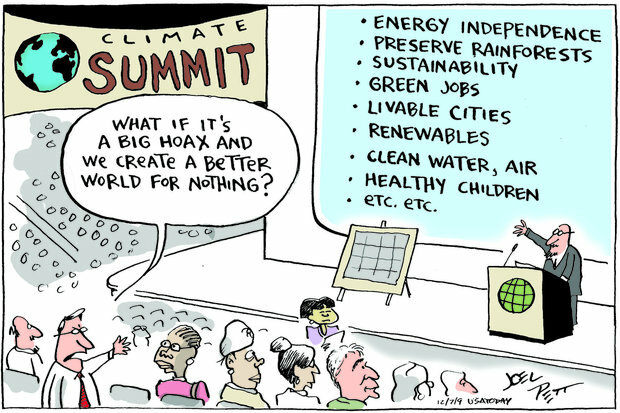 But the idea that they are voting on a scientific idea is just … UGH!!! Wow. Religion attempting to do something constructive! Not only recognize the state of scientific evidence on something, but actually not be head-strong asses, in that they’re reaching out to someone who may believe something very slightly different from them! But, does Pastor Joel Hunter get accolades? Praise from his fellow Christians in his attempt to bring together Muslium, Jewish, Catholics, and Protestants? This episode was brought to you by ChristianLove™, ChristianCompassion™, and ChristianTolerance™. Some things are just so obviously crazy at WND that I have decided it’s just boring and repetitive to address it. The blood moon stuff, black mob violence, even EMPs … getting old and repetitive, and the middle one I’ve refused to address more here because of it’s ridiculously skewed and racist reporting. Thesis: Points to isolated incidents of cold weather and therefore an overall warming trend is wrong. Reporting On: The projection of 0.4-1.0 °C temperature rise over the next 2 decades has been “quietly” revised down to 0.3-0.7 °C. Reporting On: It was cold in Chicago, therefore the globe isn’t warming. Reporting On: Fungi can regulate the amount of carbon in soil. Commenters: Top-rated “FauxScienceSlayer”‘s comment claims that CO2 is mandatory for life, therefore natural, therefore good, and it has “ZERO ability to store or ‘redirect’ radiant energy.” The rest of his comment is just as crazy and wrong. My Take: Why would I ever turn to the US Senate to get a lesson on science? My Take: And 25% don’t know that Earth orbits the Sun, and over 40% think that the Judeo-Christian God directly created humans, many of them 6000 years ago. As with the previous, why would I turn to the American public for a science lesson? Some non sequitur on taxing electric vehicles to build roads? My Take: It’s from The Daily Mail … ‘nough said. My Take: Remember — weather ≠ climate. Simple as that. I really have no idea what’s going on with this one. It sounds like a petulant child stamping his foot for not getting his way. There are allusions to Galileo, the Borg, and Nazis. If you want to read a weird one, this would be a good read. His Thesis: That there’s one guy (Tim Ball) who says it’s going to stay really cold for another 25 years. My Take: Argument from authority strikes again. Remember that you can always find a scientist to say something. Should you believe that one compared with the thousands that say the opposite? Maybe, but what about you, who has no expertise on the subject? Don’t you think it’s a tad arrogant to think that you are better informed to make a decision on something than the people who have been studying it their entire lives? My Take: See above. And, this is exactly like those people back during President Obama’s second election who claimed that every single poll conducted was wrong, skewed towards Democrats, so Mitt Romney was really going to win in a landslide. These guys are doing exactly the same thing – making ridiculous “corrections” because they perceive a bias – and getting the results they want instead of what’s really going on. Reporting On: The top-Senate-climate-change-denier, Jim Inhofe (Republican (duh), Oklahoma) said that President Obama was lying about climate change. My Take: A Republican denying science and accusing a Democrat President of lying? Must’ve been a slow news day. My Take: Not worth even dignifying with a response. His Thesis: Liberals are using a manufactured fake crisis to fund unpopular investments in clean energy. And a columnist on the rightest-of-the-right-wing websites is going to explain why 97% of the world’s climate scientists are wrong. Refer above to my mention of arrogance. Reporting On: Again, Tim Ball. Who’s selling his book, The Deliberate Corruption of Climate Science. Ahem. 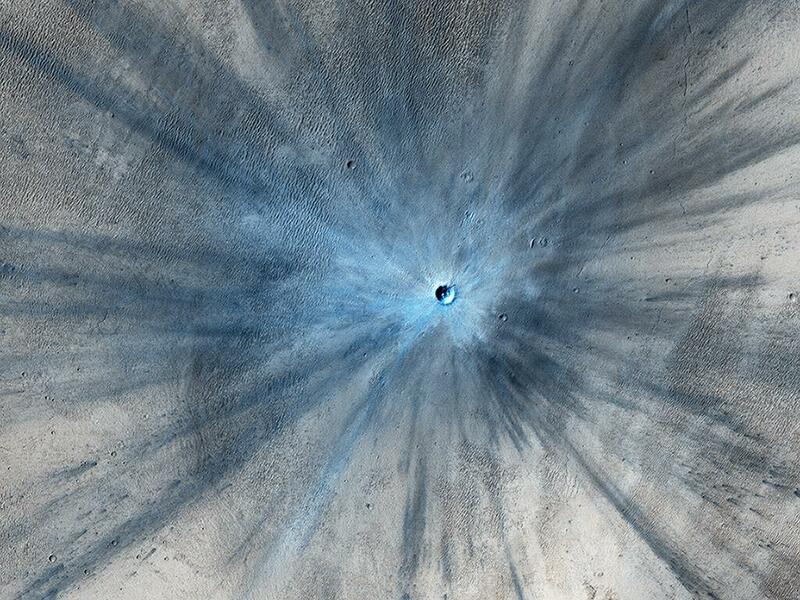 So, this made news a few weeks ago, a new impact crater on Mars, formed between 2010 and 2012 (we have before and after images). It’s a straight-forward article, no WND spin, but I left it open just in case something crazy happened. Well, it’s gotten 6 comments. The first one is by “jagiorda” which – to me – reads tongue-in-cheek purporting that it’s fake like the moon landings, evolution, “and a round earth.” To me, that last part is what gives it away as a Poe. The moon landing very well “could” have been a hoax out in the Nevada desert, which at night looks very much like moonscape. I don’t believe that back in the late sixties that they had the technology to put a manned mission to the moon. Today yes, then no. Evolution is a false branch of science though other science branches are true. Evolution was just put in science to destroy belief in God and so control the masses. Whenever there is a God fearing people the government has a very hard time controlling the people. Destroy God, subject nations. And yes the earth really is round, that I agree on. There is an exact replica that was of the Sea of Capricorn built somewhere they practiced on. I believe in Arizona. As well I have listened and read quite a bit about it , by very astute people with Degrees up the Wazoo as to why and how it was not real. Passing through the Van Allen radiation belt twice should have caused all the Astronauts to have died within several years. The most spectacular photos ever taken by non photographers with a Hasselblad camera that didn’t even have a view finder on the camera because it couldn’t be used with the helmet and gold visor. They were trained for ONE DAY as to how to use it and take photos. . Film that went through the great amount of radiation , and there is NO RECORD of any lead lined or anything else to have protected the film. I know for a first hand fact , airport X-ray machines wiped out film back in the day of actual film. Can’t remember which astronaut it was , but he was asked what it was like and he couldn’t even describe it , he said ” it was like a dream “. Yeah , dreams can be described and one of a few who walked on the moon can’t remember what it was like ? Nor describe it ? Pretty strange. Russia and China both said it was fake , which you can understand them saying. But why wouldn’t Russia go ahead and send their own even after we were to have made it to the moon? Because they said it couldn’t be done is why they didn’t. The ” moon Rocks ” are indistinguishable from earth rocks. They were examined a few years back in Hawaii , the samples of earth and ” Moon” rocks were sent to be emxined and BOTH samples had been pulverized to dust , no longer even rocks per se. Why were they ground into powder ? Then they were identical. Although some say the moon was spun off from earth by an impact on earth creating the moon. And all of the dust billowing up as the module landed on the surface, then photos of the landing pads with NO DUST whatsoever having managed to settle back down onto the pads. Perfectly clean. Who knows , but I have my doubts as to the truth telling integrity of the government. Does everybody still believe a poor marksman with a rifle with bad sights hit the head of a moving target from an elevated position in Dallas ? Or that he was the ONLY perpetrator ? There’s much , much more that I’m not going to bother typing. But if the US Gubermint spent who knows how much Cha-Ching on something and telling the public we were ” going to beat the Russians to the moon ” during the height of the Cold War , then finding out they screwed up and found out it wasn’t possible , I can see them faking it to save face. Wow. So, because the moon landings “very well ‘could’ have been a hoax” (they weren’t), evolution is a false branch of science which means we’re out to destroy God? At least he agrees that Earth is round. The reply is just a stream-of-consciousness litany of easily debunked moon hoax go-to arguments. For my first post in about three weeks, I have just as many WND stories on climate change that I’m going to just compile here, mostly to point out that — yup!! — they still think it’s a fraud and conspiracy and liberal propaganda, etc. etc. etc. One story is from November 24, 2013: “Democrat: Stadiums at Risk from Sea-Level Rise“. It’s a 2-paragraph excerpt from a CNS News article where Sen. Sheldon Whitehouse (D-RI) “warns sports stadium are at risk from the ‘sea level rise effects of climate change,’ and that climate change specifically threatens hockey and skiing.” I’m not quite sure what I think about that since it seems somewhat minor relative to everything else that climate change threatens, but if that’s the only way to reach people (“Oh noes! Sportses will be ruined!”), then I’m all for it. The story got a meager 3 ratings (3.67/5 stars) but 49 comments. The comments are exactly what we’ve come to expect from WND: Global warming is fake and Obama is a Kenyan-born Muslim. Sigh. Next up is an actual article on the subject, from November 25, 2013, by WND’s own “senior staff reporter and Jerusalem bureau chief,” Aaron Klein: “If You Like Your Climate, You Can Keep It.” Two interesting bits on this one before we even can get to the article. First is the URL, which implies the article was initially titled, “Here’s Brains Behind Climate Change Deception.” Second is the sub-title: “Obama minion strikes again in massive effort to deceive Americans.” President Obama has minions now? Makes him sound almost … diabolical? The story is about marketing, claiming that it was “progressive pollster Celinda Lake” who “recommended the use of the term ‘climate change’ after her research found many people were not buying into the term ‘global warming. '” The entire rest of the article goes off of this premise. Now, I cannot speak to whether that’s true from a political standpoint. What I do know is that the term “global warming” is accurate, as is “climate change.” “Climate change” is just more accurate. That’s because, just like in the last ice age, the entire globe was not covered in ice. Summer was still warm. It was just that winters were colder, climate overall was colder, and so accumulated snow and ice was more stable and melted less, creeping farther south in the process. Similarly, global warming is the same, but opposite: Not everywhere on Earth will experience a net warming (though those locations will be few and far between), and certainly not all locations will experience the same amount of warming. You will still get cold winters. They will just be less frequent. You will still get ice and snow. It will just stay around less. Ergo, “climate change” is a more accurate term, overall, for the average person to understand the concept. Surprisingly, Klein’s article does not appear to be widely read with only 17 ratings averaging 4.47/5 stars and an anemic 37 comments. Nothing new in the comments here, either. The final article is by birther-in-chief, Jermoe R. Corsi, posted on November 29, 2013: “U.N. Milks ‘Warming’ Claim to Spend Half-Trillion-Plus.” Not sure why he put in that last hyphen. The first paragraph states: “Acting on global warming fears, the United Nations and the World Bank urged the spending of $600 to $800 billion a year on “sustainable energy” as an alternative to continued reliance on oil and natural gas.” And that’s the jist of the rest of the story. I have not seen any conservative / climate change = conspiracy person argue against it other than sorta muttering in a corner about “free markets.” This article has garnered 14 ratings (4.38 average) but a relatively large 113 comments. As with the other two, the comments are predictable and not worth going into. World Net Daily has published several other articles over the last few weeks about global warming / climate change, but I did not open them up to write about — no catchy headlines. Though, I wrote this post on an airplane and just checked my RSS feeds and Bob Unruh has one up from 3 hours ago: “‘Global Warming’ Iced By ‘Coldest Days Ever.’” It’s an actual full article, and given that, and the catchy headline, in 3 hours it has gotten 13 ratings (4.38/5 stars) and 4 comments. Again, nothing that you wouldn’t expect from WND (including the lovely non sequiturs like, “Marxists hate to lose.” by “Ruler4You”), but worth mentioning given my last paragraph. A Non Sequitur Means We Hate Climate Scientists Even More! In 2006, some researchers were dredging the bottom of the North Atlantic ocean near Iceland. They pulled up a lot of creatures, put ’em in a freezer for later analysis, and did their work. These researchers happened to be climate scientists looking for data on past climate, which can be done by studying ocean sediments and the way that growth rings are created in mollusks like clams. To estimate the age of a mollusk, you count the number of rings since a new one is laid down every year (every growing season) just like tree rings. When the scientists did this a few years ago, they estimated an age of around 400 years, but several of the rings were highly compressed and difficult to distinguish. The latest research puts it at 507 years, making it the world’s oldest known living animal. Until they killed it by opening it to estimate its age (and probably also killing it by putting it in the freezer). Sad? Sure. The oldest [anything] is kinda neat. And it probably would have went on living for many years to come. Its existence also means there are probably others like it that are just as old, give or take a few decades. When I read this story on a normal news site, the story was the revised age by over 100 years. When you read this on WND, it’s that these scientists were climate scientists and they killed something: “Climate Scientists Kill World’s Oldest Creature.” In other words, this article is brought to you by a few logical fallacies such as the non sequitur (doesn’t follow, as in two unrelated things) and poisoning the well (naming dirty icky climate scientists so we like them less). Fascinating. Note that no where did it say whether these particular climate scientists think climate change is real. No where do they talk about “grabbing power.” And determining the age of something after it is dead is a standard practice and technique that has nothing to do with politics. Ah … World Net Daily.